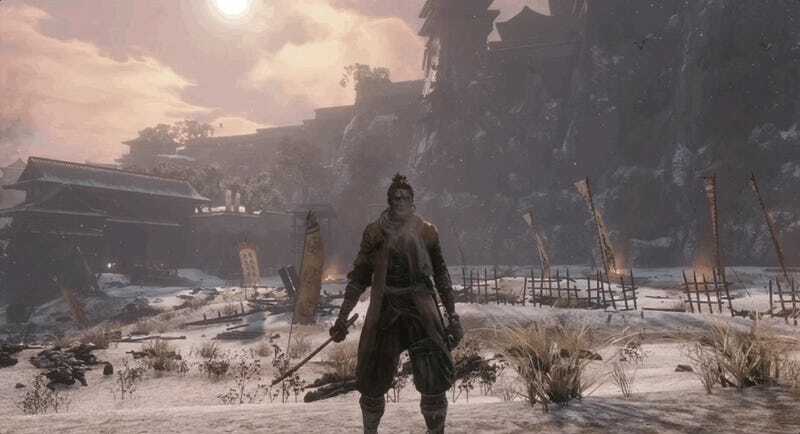 Sekiro: Shadows Die Twice often boils down to intense sword fights between stern warriors, but a little trickery never hurt. One shinobi tool stands out with defensive capabilities that make difficult encounters much more manageable. It can turn even undead monsters and literal demons into pushovers. It’s also a humble umbrella. When I played through Sekiro, I didn’t use that many prosthetic arm upgrades besides the Firecrackers. The little explosives stun enemies and interrupt attacks, buying time to escape or land extra hits.As I prepared for my second playthrough and cleared out some remaining side bosses, I decided to experiment with my ninja gadgets. The Loaded Umbrella, Sekiro’s version of a shield, didn’t seem particularly remarkable at first. But it turns out that its upgrades, which resist everything ranging from hellfire to ghostly energy beams, are worth investing in. To get the Loaded Umbrella, you need to buy the Iron Fortress material from Blackhat Badger in Ashina Castle. After that, you’re able to unlock the Loaded Umbrella and craft through the tool tree to get special variations. This can take some work. For instance, if you want the undead-resisting Phoenix’s Lilac Umbrella, you first need to craft the Mountain Echo whistle and Loaded Umbrella - Magnet variation. It’s worth it, though. All those pesky Headless who were hounding you throughout the game? The ones you really needed to use the stat-boosting Divine Confetti item to stand a chance against? The Lilac Umbrella turns them into a nonfactor, especially if you have the Projected Force skills from the Prosthetic Arts tree. It allows you to attack out of your umbrella’s defensive stance, imbuing your sword with the same attribute the umbrella has. Here I am using it against an annoying Shichimen Warrior, whose projectiles can cause instant death. I almost feel a little bad for using the umbrella. There’s a part of me that wants to do it the tricky way, but Sekiro’s shinobi tools take the adaptability of Bloodborne’s trick weapons and add a little Mega Man lock-and-key design to the combat. Sekiro is an action game, and I’ve loved playing it as one, but using the Lilac Umbrella to defeat undead foes makes it clear that Sekiro is also functioning a bit like a puzzle game. For instance, bringing Suzaku’s Lotus Umbrella radically changed my fight against the Demon of Hatred. They’re one of the toughest bosses in the game, a rampaging beast who looks like the long-lost cousin of Manus from Dark Souls. One of their attacks is to leap into the air and slam down, creating a massive wave of fire. It’s hard to dodge, but using the right umbrella negates a majority of the damage. In a game where you’re mostly at a constant disadvantage, having any kind of leg up on the enemy is appreciated. The umbrella has me eager to experiment with more options on my second playthrough. Used wisely, the prosthetic upgrades capture the ninja fantasy of using brains as much as brawn to survive. Think smart and plan ahead, and if you have the right tools, you can thrive in even the most dire situations. That’s exciting, doubly so when it can allow you to stand tall against the game’s toughest bosses.